Act with ambition’ was the rallying cry on the 12 December, when over 250 UHC2030 partners and many others gathered in Geneva to celebrate the goal of universal health coverage (UHC) on UHC Day 2016. Guests attended from governments, UN agencies, civil society, academia and the private sector, all contributing to a memorable evening, which highlighted the range of ambition and commitment to achieve UHC, and also some of the challenges that countries face. The event was organised by the International Health Partnership for UHC 2030, the World Health Organization, the World Bank Group, Bill & Melinda Gates Foundation, Rockefeller Foundation and Save the Children, and was moderated by Ms. Natalie Phaholyothin, Associate Director, Rockefeller Foundation. Prof. Piyasakol Sakolsatayadorn, Minister of Public Health, Thailand, opened the event with a startling reminder of Thailand’s motivation for achieving UHC. "Thailand realised that because we are poor, we cannot afford NOT to have UHC". Prof. Sakolsatayadorn also pointed to development partners’ moral obligations to strengthen sustainable country capacities for UHC. Mr. Simon Wright, Head of Child Survival, Save the Children, stressed the importance of a focus on domestic public financing for health and improving the efficiency of available health resources, with external aid as supplementary to make progress towards UHC. Mr. Dana Hovig, Director of Integrated Delivery, Bill & Melinda Gates Foundation, urged the need for primary healthcare systems on the path towards UHC, which can cover 90% of health needs and should put people at the centre of health services. Dr. Agnès Soucat, Director of Health System Governance and Financing, World Health Organization, then celebrated the advancement of monitoring progress towards UHC with the adoption of the UHC financial protection indicator 3.8.2 and the launching of the WHO UHC data portal. Dr. David Weakliam, Chair of the Global Health Workforce Network, outlined the Commission Report on Health Employment and Economic Growth and Global Strategy on Human Resource for Health, emphasizing, "There can be no UHC without a health workforce" introduced the renewed Global Health Workforce Network. Dr. Samuel Sheku Kargbo, Director of Health Systems, Policy, Planning and Information, Ministry of Health and Sanitation, Sierra Leone noted the problem of private payments. "Out-of-pocket expenditure is a problem. People don't go to health facilities, and we need to remove this burden." Dr. Jeanette Vega, Fondo Nacional de Salud, Chile reflected that primary healthcare provides integrated services, by providing promotion, prevention and care and primary health care systems should be closer to where people live and work. Ambassador John Quinn, Permanent Representative of Australia to the United Nations in Geneva, said that donors and other development partners need to take a coordinated approach and act sustainably for the long term. Ms. Priya Madina, Director of Government Affairs, Global Issues, GlaxoSmithKline, pointed out that, while it is an integral part of the SDGs, the role of the private sector is missing in the UHC discussion. Ms. Madina stated that GlaxoSmithKline stands ready to lead the private sector effort to achieve UHC. Dr. Timothy Evans, Senior Director of Health, Nutrition and Population, the World Bank Group, summarized the event, arguing for the need to move to pooled public financing to reach UHC as out-of-pocket expenditure is the most popular form of private payment for health, which is not equitable and efficient. 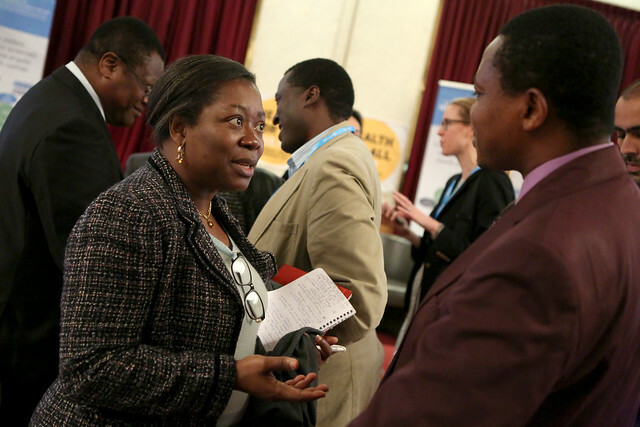 This UHC Day celebration took place on the margins of the meeting UHC2030: Working Together to Strengthen Health Systems, taking place on 12-13 December in Geneva, Switzerland. This bigger meeting was to foster productive exchange between various health systems partnerships, actors and agencies, and build awareness of UHC2030. You can read more about this meeting here.